John Bost at the dedication of the Arboretum's new bench honoring Edna and Hugh Green. A gift of $127,000 from the estate of World War II Navy veteran Dudley Green has established a new endowment in support of the UC Santa Cruz Arboretum. 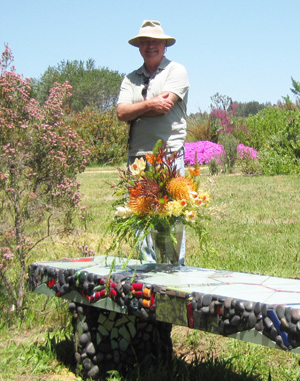 The endowment, named the Edna and Hugh Green Fund in memory of Mr. Green's parents, is designed to foster continued student involvement in the UCSC Arboretum. The endowment will provide support for work-study students as well as student interns and volunteers working with Arboretum staff on senior theses and other projects. Students will have opportunities to earn course credits through work in the Arboretum that enables them to learn about plant conservation, habitat restoration, and horticultural principles and techniques. John Bost, a retired estate planning lawyer and professor emeritus at San Diego State University, designated the $127,000 gift to create the Edna and Hugh Green Fund. Bost, the author of Estate Planning and Taxation, was the conservator for Dudley Green for thirty years and managed his financial affairs. He and his wife Jenny visited Green and took him to enjoy meals, music, and gardens over the years, providing him with some sense of family after the passing of his parents. Green wanted part of his estate to honor his parents, Hugh and Edna Green, and as part of his estate plan designated Bost to select the charity. Bost said he chose the student educational programs at the Arboretum to receive the funding because it fit with Green's enjoyment of gardens and his desire to help others. The Bosts, who are long-time Arboretum volunteers and donors, also commissioned a bench in honor of Hugh and Edna Green that was placed along what will be called the "Green Path" at the Arboretum. The bench, crafted by local artist Susanna Arias, is located in the native garden by the Arboretum entrance. Visitors can sit and enjoy the native garden to the southwest or the proteas of the Dean and Jane McHenry Garden to the northeast. "Jenny and I are pleased to present this bench as a gift from us to the University's Arboretum. May it stand as a testament to Dudley's generosity and as a commemorative in honor of his parents, Edna and Hugh Green. We hope that visitors looking at or resting on this beautiful bench will pause to think of and honor their parents as well as other family members and friends who have offered them love, support, and care, especially during difficult times. Let us also thank our own parents and remember them. Those of us with children, let us think of them and appreciate the importance of that reciprocal relationship, full of love and respect without limitation." Arboretum director Brett Hall said that Dudley Green's gift, as well as the recent $100,000 gift from Professor Emerita Jean Langenheim for "Strengthening Ties Between the Arboretum and Plant Sciences Faculty," have truly helped the long-term stability of the Arboretum. He added, however, that short-term funding remains a challenge for the Arboretum, because these endowments will not start paying out until fall 2012, and current income from plant sales and annual gifts has been low. Hall and the Bosts are encouraging people to shop at the store, buy plants at the major sales, and donate what they can afford to help with the short-term, day-to-day operations of the Arboretum. Visitors can find the new bench by starting at the entrance parking lot and walking up the Arboretum's "World Tour/Elvander Trail" for about 80 yards, where the bench can be spotted from sign No. 25 on the Elvander Trail. Information about the UCSC Arboretum is available at arboretum.ucsc.edu. Admission to the Arboretum is $5 per person, with free admission on the first Tuesday of each month. Admission for UCSC students is free.